for £12.30 postage paid world-wide. Colin Twigg originates from Skipton, North Yorkshire, but relocated to Wolverhampton, Middlesborough and Grimsby in his early years. Taking up the violin at the age of seven, his rapid progress on the instrument helped gain him a place at the Menuhin School, where Margaret Norris was his teacher. He then traveled to the States to study with Oscar Shumsky at Yale and Tossy Spivakovsky at Juilliard. Since his return to the UK he has held several positions in orchestras and chamber groups and he now leads the London-based Bridge Quartet. Alongside this he maintains an active role as a composer. All the music here is making its recorded debut. The Phantasy Variations on a Theme of Haydn was written for the Bridge Quartet, who favoured something along the lines of a single movement ‘phantasy’. The bicentenary of Haydn’s death occurred in 2009, so Twigg aptly chose the ‘Emperor Hymn’ from Op. 76 No. 3 as the source. In addition, a commission from the Gloucester Music Society for their 80th season provided another incentive. The variations are crafted with imagination, ingenuity and invention. Haydn never strays too far away, and his inspiration is conspicuous in the geniality and good-humour that permeates the score. The String Trio is the earliest work here, and was composed especially for the Montpellier String Trio, of which Twigg was a founder member, fulfilling the role of violinist/violist at the time. A brief work, cast in four movements, it incorporates styles ranging from the Renaissance to the 20th Century. The full technical arsenal of string playing is summoned, with double stops and pizzicatos peppering the score. The opening movement is through-composed, offering very little in the way of material repetition. A variety of moods are explored, with the opening sounding a bit ‘jazzy’ to me. A playful Scherzando follows. The slow movement is beguiling in its melodic flow, and has something of a wistful flavor to it. The finale is energetic, and delivered with verve and vigour. Members of the Bridge Quartet are joined by pianist Hiroaki Takenouchi for the 2004 Piano Trio. 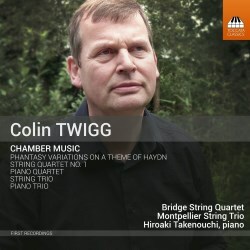 It was premiered in Birmingham in April of that year by the Dadelsen Piano Trio, for which Twigg did the violin honours. The first movement contrasts a somber, contemplative and introspective demeanor with one more confident and vital. The Scherzo has something of the burlesque about it, with a restless persistence underlying the ostinato passages. A soliloquy on the violin leads into a spirited finale. Twigg gave himself a demanding violin part, which he here negotiates with gusto and gleaming virtuosity. The First String Quartet is the most substantial work, and it pays homage to Hukvaldy, the birthplace of Leoš Janáček, who is an enduring presence throughout. It’s more compositionally advanced than the other music on the disc. Its use of whole tones, polytonality and its rare forays into atonality, give it a uniquely eastern European flavour. Three of the movements have a rugged energy, and it’s only in the third movement Adagio that we find some repose, albeit awash with gloom and despondency. The Piano Quartet (2000) started life as a basic outline for a piece for viola and orchestra. The end-result was a chamber work in which the individual instruments have an equal role. As I was listening to it, I was conscious of the fact that the composer had given all the players their moment to shine. The work is structured in three movements. The first is romantically inclined. In the Andante Sostenuto which follows, the soloists indulge in a dialogue, with the viola’s line particularly fervent. An Allegro giocoso, containing an attractive lively fugato section, rounds things off. I’ve found this CD album very rewarding, enabling me to explore some uncharted by-ways. The music is both accessible and deftly crafted, and the recording boasts warm, radiant sound. The composer has provided his own annotations, which not only offer a background portrait of himself, but also a detailed description of the music on offer. I have nothing but praise for this delightful release.